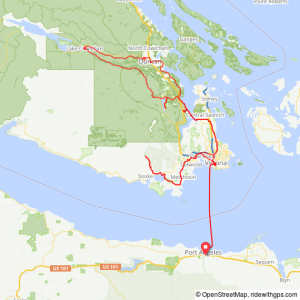 Opted to head to Vancouver Island again with no plan (sans a Warmshowers host in Duncan) to ride a few new trails, stay in new places and take new ferries. This would be my 4th cycle tour and 6th visit in the area in 3 years – I so love it here! A quick ride from home to the Blackball Coho Ferry…about 7 minutes from my house. Had a nice chat with folks in the queue, and was up and on the ship early. Met Jennifer, a writer and former reporter from Portland and we chatted for the entire journey – we talked everything from social justice, cooperative Methodists housing to her formerly imprisoned brother, Unitarianism and her work with the Sisters of the Holy Names of Jesus and Mary. Perfect start to the trip. On queue, my exit from customs involves navigating to Mo:lé for breakfast – always. Then a quick jaunt down Pandora St to the Johnson Bridge and onto the Lochside Trail. 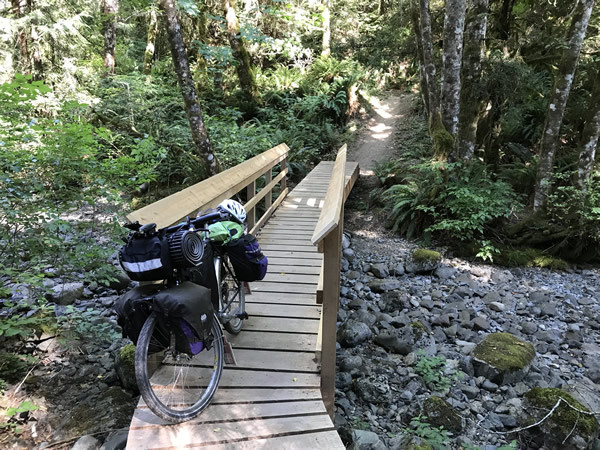 While stopped near the intersection with the Galloping Goose trail, met Ian who had many riding experiences in the PNW to share, then he stopped for blackberries and I continued (blackberries were everywhere). At the intersection before the tunnel I opted for Sooke Potholes Provincial Park to camp. 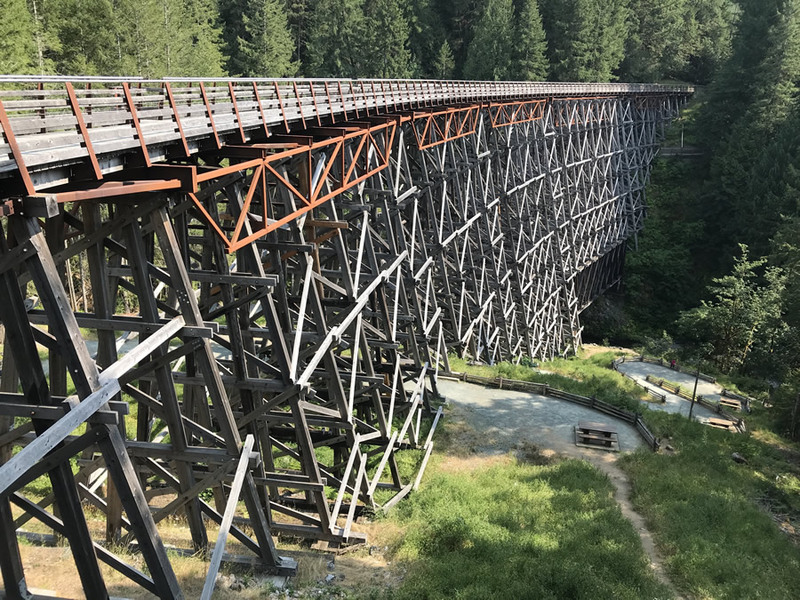 The Galloping Goose is wonderful, but this year a little detour at the Todd Trestle proved challenging…made it up a the first 18-20% loose grade, rode the middle section and had the final 18-20% loose grade climb and descent. Not too bad. 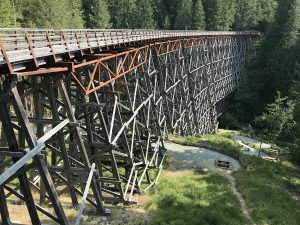 Trestle should be repaired by 2019. The always pleasant Vancouver Island T’Sou’ke First Nation caretakers of the camp gave me a choice of the $15 bike spot, so that was my place – it looks a bit exposed, but is actually a nice hangout if the sun isn’t beating down. Talked with a few dog walkers as night fell and was in the tent and ready to sleep by 8pm, despite the lingering evening heat. Seems a good 56 miles on a loaded bike after two weeks of no riding warranted rest. Who knew…. Up at 6am and after a little coffee I hit the road. This time took the road which follows along the river until hooking back to the trail around the 43km mark below the bypass. Much easier! Not really knowing where to go next, I opted to work my way north and after a quiet meander along the GG caught the Lochside north. Having ridden these routes a number of times, there’s a certain familiarity with the turns and landmarks along the way. I love it. The pigs, the grocery, the wine store, and this time some miniature Shetland ponies to see the kids giggle over during my lunch. 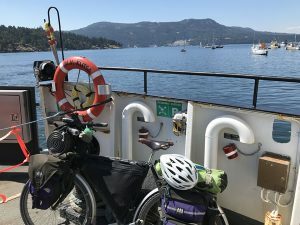 Opted for the Brentwood Ferry to Mill Bay to cross the Saanich Inlet and head to Bamberton Provincial Park. West on Island View Rd to East Saanich Rd and onto Stelly Cross Rd was just pitches of 10% grades in the sun. Once over the top at Seabrook it was downhill to Penden Rd and drop to the ferry. $8.80 and all I had was $9, so 20 cents went to the dog biscuit fund…. Was my first time on this ferry route and no quite sure where to go next, but decided to try Bamberton Provincial Park. New park to me, so after the long hot climb on Mill Bay Rd to the entrance was treated to shade and a beautiful setting in the trees. Rode around until I found an available site (#41) and set up camp. Was surprised to see Mike the ranger here! We had met a couple years before when he worked at Ruckle Park. He told me about another place he manages called Discovery Island, where a lone wolf has taken up residence since 2012. 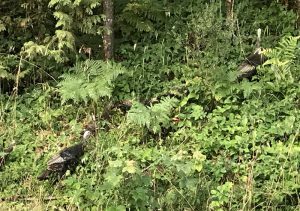 It appeared almost at the same time that Chief Robert Sam of the Songhees First Nation died, so its arrival was seen as auspicious sign and is left alone there. How cool is that? Met my cool neighbor who was solo with three little kids – she got her huge tent out and setup faster than I did, impressive. The kids were sweet and curious. After dinner took a stroll to the beautiful beach area and went to bed early. Camp packed up by 7am to ride in the cooler temps to Mill Bay, though nearly 75F by then. Found a little coffee shop and had some amusing conversations about recumbents with the owner, then headed to Rusticana for a mango iced tea and free wifi in the gorgeous garden area. 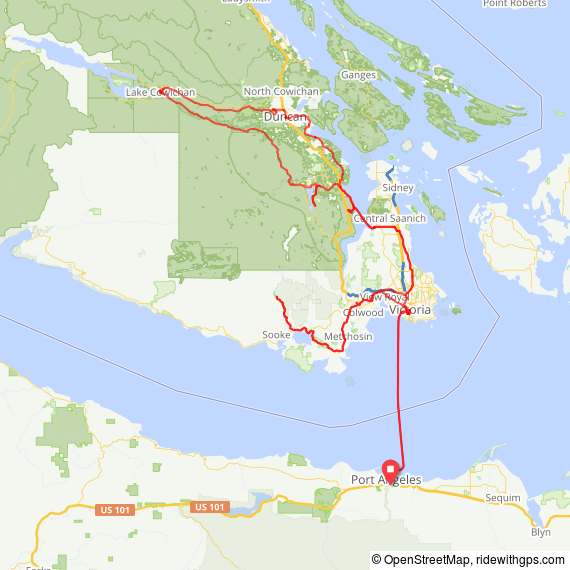 Found a mellow access road which kept me mostly off Vancouver Island’s busy Hwy 1 and navigated north through the bucolic, vineyard-laced countryside to Cowichan Bay. Such a busy place squeezed along the water! Walked out on the pier overlooking the marina and then over to Hillary’s Cheese place for a sandwich. Had wifi there and contacted my Warmshowers host Haley. Turns out she worked just up the road at the Cowichan Estuary Nature Centre so stopped in to say hello and make plans to meet later in Duncan. 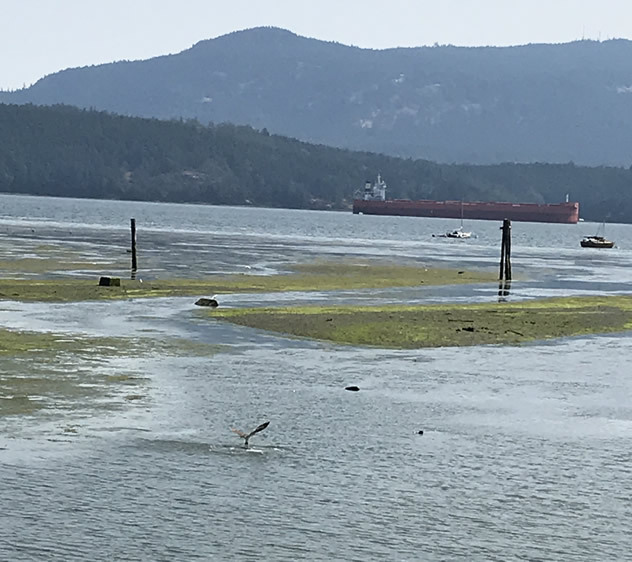 While there, watched the dozens of herons in the estuary and an Osprey hovering over the water and diving to catch fish – nature rocks! The route to Duncan was short & hot and based on Haley’s recommendation I stopped at the white tents in the park where the annual 39 Days of July was presenting music and entertainment all day. 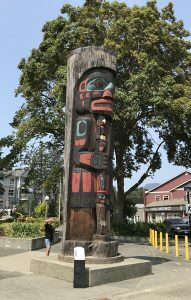 Chatted with a homeless fellow named John and he told me all of his tales, then visited the museum and took a walk to see the totems in town. 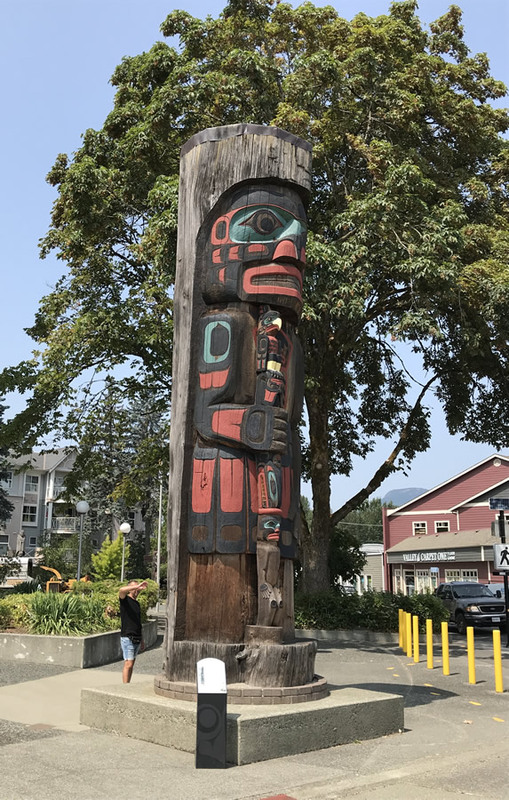 Amazing array with dozens of various totems on every block. Found the Craig Street Brewpub and settled in to enjoy a Greek-Ceasar salad and a pilsner before heading to Haley’s. Only my second Warmshowers stay, but wanted to meet more Canadians along the way and Haley was amazing. So easy to be with and we could have talked for eons about environmental issues, politics and touring/traveling. Felt good to have a shower and she shared her grapefruit radlers with me – my favorite. Wish I could have stayed longer and look forward to meeting up again soon! 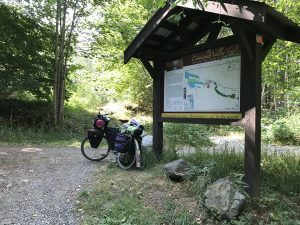 Got an early start and right across from Haley’s was the north Cowichan Valley Trail. Smooth, packed surface and quiet with well-appreciated shade cover under the trees for most of the route. Passed by the Paldi Sikh Temple (Gurudwara Sahib ji, one of only two on Vancouver Island), and soon was in the town of Lake Cowichan. After crossing the Canadian Pacific RR bridge into town I noticed a fellow taking my picture. I stopped to say hi and turned out he was John Crouch, a travel writer (Cycling the Islands: A Guide to Scenic Routes on the San Juan and Gulf Islands and Hike Victoria among others). He took a few more photos of me at the trailhead for his new book, Cycling on Vancouver Island and I headed into town. Initial plan was to camp again at Lakeview where I stayed on a previous trip, but no campgrounds had any spaces available. Tried the Uptown Motel, but there were not there. 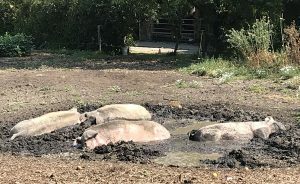 Couldn’t find any breakfast place until I crossed to the north side of the river and found the Cow Cafe & Cookhouse that a woman on the trail recommended. Wonderful service, staff and delicious Red Hot Benny Bowl – spicy buffalo chicken, peppers and eggs with hollandaise sauce, so yummy! Turned onto Renfrew Rd to head back toward Mill Bay as the Lake Shawnigan Provincial Park had no camping, so would have to wild camp somewhere. By this time I was tired, dusty and overheated, and the road was horrible traffic and hilly. Made it to Mason’s Store to stock up on water and found there was no lodging anywhere nearby. With such a popular lake you’d think there would be but only day use parks and private property. Left the store and promptly took the wrong road down the east side of the river till I realized my mistake – duh! It was already 6:30pm and I was cooked. Finally found the correct road to Mill Bay and started looking for options. Saw a woman about to leave work and asked her about a place to camp. Katherine was such a kind soul and showed me a secret spot I could stay! Can’t reveal it – sorry! By 7:30pm I finally was somewhere relatively quiet and shady, set up the tent with no fly, skipped dinner and watched the nearly full moon as I dozed off. Awoke early and packed quickly under the watchful gaze of a black and white cat who seemed bemused by me. 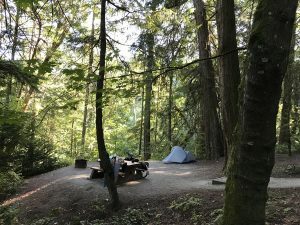 Was a beautiful Vancouver Island morning, cool and quiet, little traffic, and decided it was time to head home and regroup instead of trying to navigate the unknown wilderness trail south of the lake back to Sooke. Will definitely do that on the next trip. 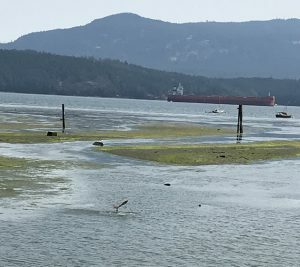 While riding back to the Mill Bay ferry I stopped to see the beautiful Kerry Community Park next to the Mill Bay Community Hall – what an idyllic gem of a place! 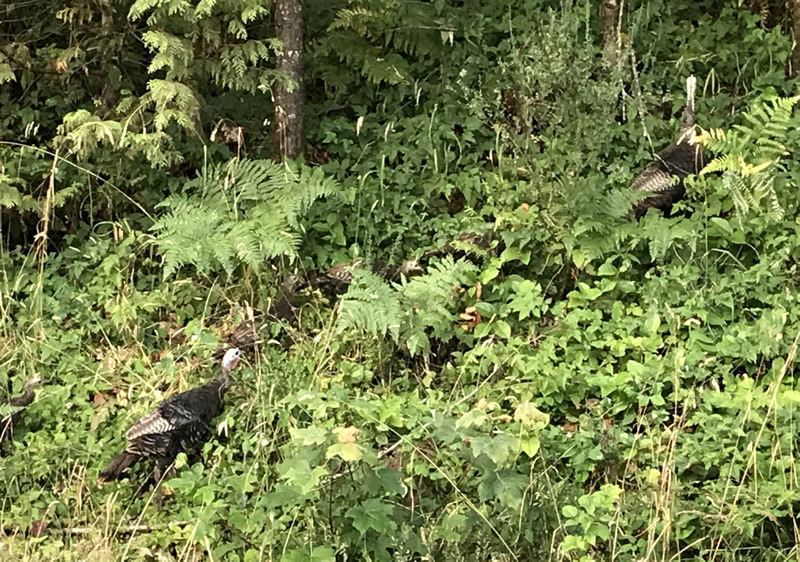 Wild turkey families were all along the shoulder. Enjoyed the cool air and rolling road to Mill Bay and was a little too early for Sunday coffee. 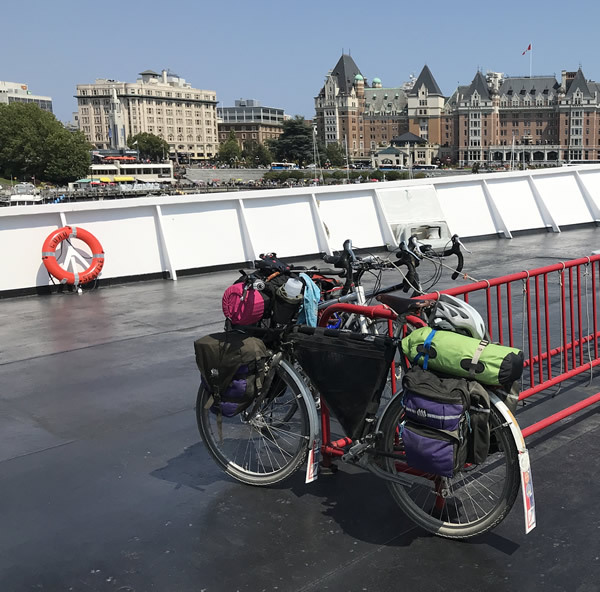 Rode to the ferry which wasn’t leaving for another two hours, but met a wonderful family from Britain who were heading to Butchart Gardens. Turns out the wife was from Brisbane, Australia, so we had a good talk about Queensland where my daughter Peri is moving this fall. A most pleasant wait for the boat and on board talked to a motorcycle racer and a crew person who was truly amusing! 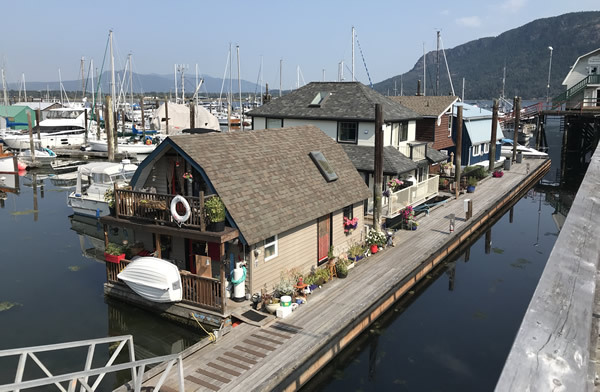 Once landing at Brentwood Bay I took the same route back to the Lochside Trail and meandered to Victoria, taking in the radio-controlled airplane field and all the activity a warm Sunday brings. Back in Victoria I explored some of the new bike trail infrastructure the city is installing – so very impressive. From the Johnson St Bridge I spied the Fishhook at Mermaid Wharf and decided to have lunch. Was a perfect location along the water, a nice glass of Hoyne’s Pilsner and a large halibut sandwich with excellent frites was the perfect end of the tour. Caught the 3pm Coho Ferry back to Port Angeles and spent the entire time on the forward deck with Dave from Clallam Bay talking about everything from Italy (he speaks Italian) to bears. Got windy and cool in the strait but arrived feeling like I’d had a great mini-adventure. Did overpack, not knowing how many days I’d be out or where I’d end up, but everything worked well and already have plans to return in the fall for more exploring. Vancouver Island, British Columbia, Canada rocks!